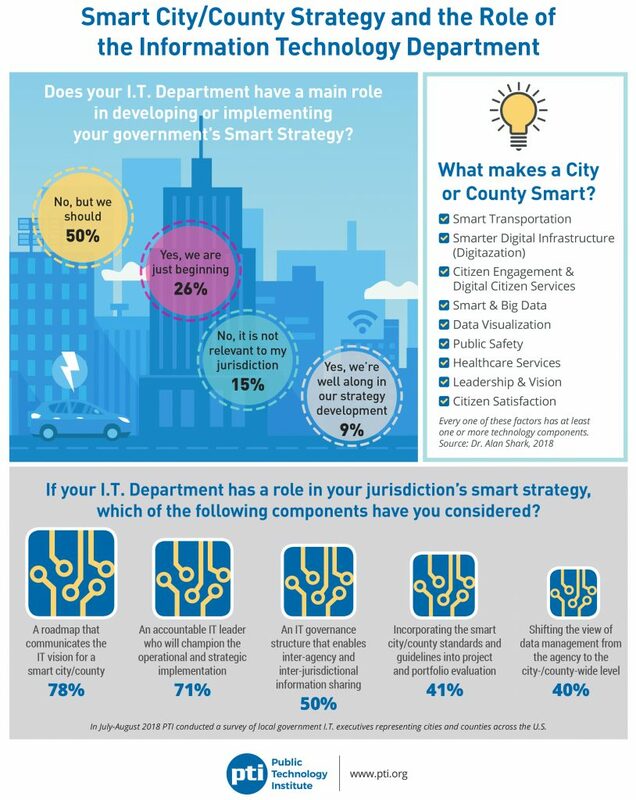 Half of city and county technology officials do not play a main role in the developing or implementing their government organization’s smart technology strategy, according to an infographic from the Public Technology Institute. Though those marginalized IT officials say they believe they should play a main role, another 26 percent of those surveyed reported they are at the beginning of their smart city or country journey, and an additional 9 percent reported they were “well along” in the development of a smart strategy. Among those IT leaders who do play a role in their government’s smart strategy, strategic planning appears to figure prominently. Of that group, 78 percent reported they had considered a roadmap that communicates the vision of the smart strategy. The results come from a national survey conducted by PTI between July and August 2018 as a part of the group’s “State of City & County Information Technology” initiative. This infographic was provided to StateScoop for publication as a part of a media partnership with the Public Technology Institute. For more information on this poll, and other PTI activities, check out www.pti.org.